When you think of keywords, the first thing that probably comes to mind is the phrases people search when trying to find your products or services. While those make up the bulk of the keywords for most companies, there’s another area you should pay attention to: branded keywords. Branded keywords are phrases directly associated with your brand like your company name, specific product names or the company founder’s name. All of these phrases are directly associated with their brand, so when people mention them on social media, Facebook knows they’re referencing their company. Check out this Tweet that uses two branded keywords without directly mentioning Facebook. Branded keywords also include common misspellings. Facebook might also want to monitor keywords like “Facebok” or “Fceboook.” You can use this handy tool to get a list of possible misspellings of your brand name. It’s easy to forget to spell check those 140 character Tweets from time to time. But you don’t want to miss out on a brand mention just because of a typo. The most obvious benefit of tracking branded keywords on social is for customer service. You want to be able to quickly reply to any questions or issues people have with your business. But another advantage of monitoring your branded keywords is to gauge how popular your brand is on social. Hopefully all your marketing efforts on your website, social media and even offline are translating to an increase in people talking about your company. If more people start mentioning your brand on social, it’s a good sign your work is paying off. 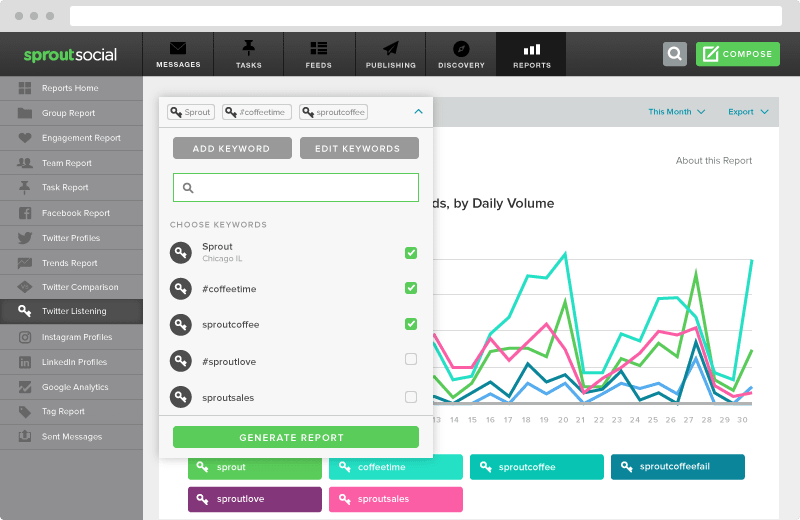 You can easily monitor the growth of your brand mentions with Sprout Social. First, setup the branded keywords you want to track. 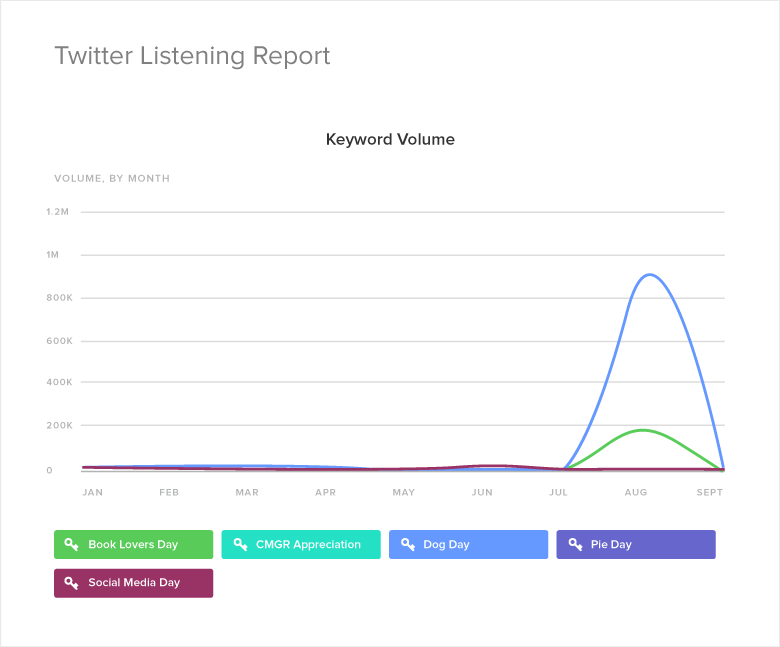 Then you could use the Twitter Keyword Report to track the share of volume of each keyword over time. It’s also easy to compare each keyword and see how they’re trending in our chart. Want to see our Twitter Keyword report in action? Take a look at how our social team at Sprout uses the report to track branded keywords and specific campaigns. Or sign up for a free 30-day trial and test it out now. Understanding what’s being said about your brand, and how much people are talking about you can help measure the success of campaigns and your overall share of volume over time. Now that you know your branded keywords and their importance, you need to start tracking them. Tracking mentions of your branded keywords helps you see what people say about your company on social. It could be a blogger reviewing one of your products, a dissatisfied customer or someone with a question. If you don’t monitor your branded keywords (especially untagged mentions), you could miss out on potential opportunities to get new customers. Even worse, you could even risk losing some existing customers trying to reach you on Twitter or Facebook. One of the best ways to monitor branded keywords is to get the right tools in place. While the major social networks have native search features, they aren’t advanced enough for what most businesses need. But don’t worry, we have you covered. 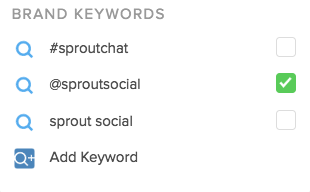 Here’s how to track branded keywords in Sprout Social. To get started, you need to make a list of the keywords you want to track. You’ll want to make sure you put some thought into the keywords you choose. For instance, you can track “@brandname” as well as “brand name” and “#brandname.” That’ll ensure you see every mention of your company, even if you’re not tagged. Don’t forget your product names and other keywords specific to your brand. Notice how we have #sproutchat as one of the brand keywords above. Since #SproutChat is our branded Twitter Chat, it’s important that we’re able to monitor conversations going on involving that hashtag, and get reports on how often it’s used. 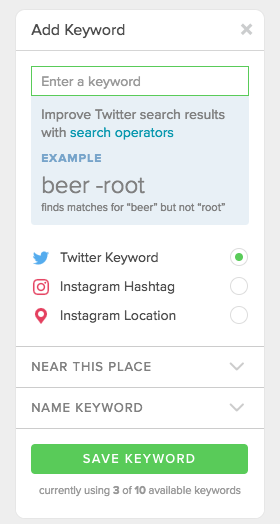 When you have your list of branded keywords, you can go into the Smart Inbox in Sprout Social to start tracking the conversations containing them. Once you save your keywords, you can monitor all the incoming social media messages that contain them. 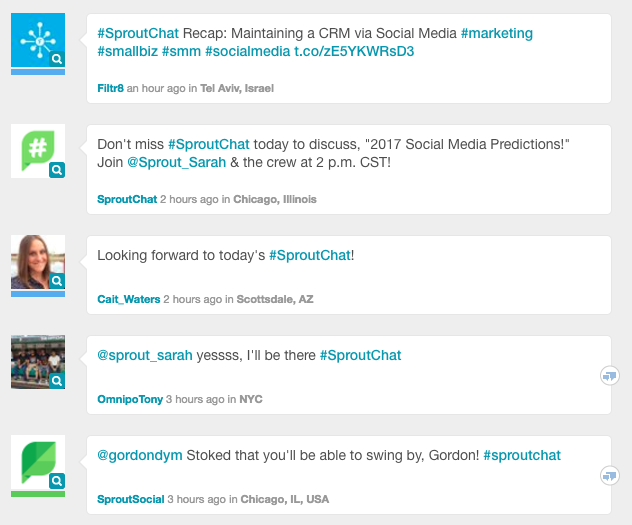 For instance, in the example below, I selected the #sproutchat keyword, so I can see all the latest Tweets that contain that hashtag. This tactic is great because you can quickly respond, or assign them to another team member if necessary. For instance, maybe you’re tracking a brand keyword that includes a product name. Then someone Tweets they’re trying to return their product. You might want to pass that Tweet along to your customer support staff to handle it instead of letting your marketing team spend time on the issue. Another cool way to track your branded keywords is through the Twitter Keyword Report we showed in the beginning of this article. This report will give you a detailed breakdown of your keywords, which you can use to make important decisions. For instance, it’s great for measuring the success of specific campaigns. 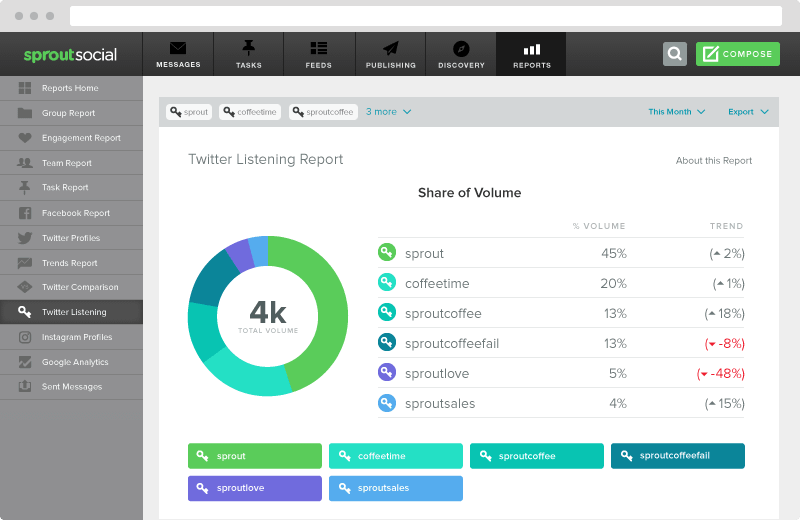 If you’re running a Twitter contest and want to see how often your branded hashtag was used, you could add it to your report and Sprout will track it for you. In addition to monitoring your own branded keywords, you can also monitor your competitors. For instance, McDonald’s might want to see how its share of voice stacks up against competitors like Burger King or Wendy’s. They could add those different brand names into the Twitter Keyword Report to compare their own brand mentions to the competition. Opportunities: When one of your competitor’s brand name is trending downward, it’s the perfect opportunity for you to amp up your efforts to gain steam. A downward trend is a sign their audience is losing interest, which means there’s space for you to overtake them. Threats: On the flipside, when your competitor’s brand name is trending upward, it means they’re doing something right. Start looking into what content they’re sharing and what people are saying about them. They may have a launched a new product or had a big media pickup. Keeping an eye on your competition’s branded keywords can help you stay on top of your industry. Keep in mind that your social media strategy shouldn’t be completely based on your competition. The goal is to gain insights from what they’re doing and to compare your share of voice in your industry. Take the first step toward tracking your branded keywords on social by signing up for a free trial of Sprout Social. Put the tactics above into action to take your brand’s social media strategy to the next level. Has your company benefited from tracking branded keywords? Leave a comment below and tell us about it.